Horse Trail Rides | Business & Tourism Creswick Inc. Located at Quirindi Stables, Hepburn Lagoon Trail Rides is set amongst the picturesque hills of the Mount Prospect district, just 10 minutes from Creswick. All riders are catered for, from beginners to experienced. The horses are well cared for and all have their own distinct personality. Horses are carefully matched to each rider. You will receive individual attention, making your riding experience a unique one. 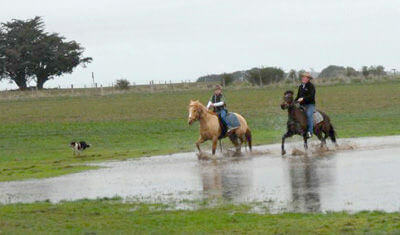 Hepburn Lagoon Trail Rides aim to ensure you feel comfortable and enjoy the ride. At Hepburn Lagoon Rides, it is believed that an important part of the ride is to sit down and chat about it afterwards. Sitting by the fire in the Tack Room is a perfect place for this. You will be offered drinks and something to eat after the ride, which really adds to your horse riding experience. For more information and bookings, click here to visit Hepburn Lagoon Trail Rides' website, or visit their Facebook page.